The Malevil Cup in Hermanice v Podještědí is one of the most traditional marathons in the Czech Repuplic and will be hosted for the 20th time. Both very attractive courses of 65 km respectively 100 km lead through the Lausitzer- and Zittauer Mountain Ranges crossing the German border towards the famous Spa Oybin. Also the numbers of celebrities are impressive: current Olympics winner of London and Marathon World Champion of Pietermaritzburg, Jaroslav Kulhavý was able to win the Hermanice v Podještědí 2014. 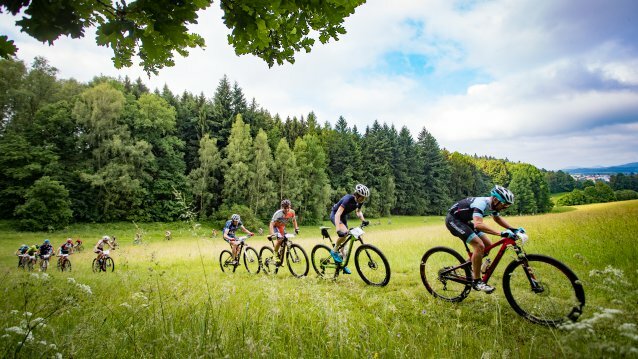 The race is part of the UCI MTB Marathon Serie 2019 and therefore especially for ambitious bikers interesting. For Rookies there are two easier tracks of 25 Km and 45 km available. The start and finish takes place at the Ranch Malevil. A total of 1.500 marathon participants as well as 200 kids and youngster for the Junior Trophy are to be expected. Online registration is possible until June, 03, 2019 until 20:00 hrs. Late entries possible onsite at the starting number distribution.